GPS N 52° 9' 22·9. W 7° 39' 15·4. Approaching Dungarvan from Cork, take the by-pass staying on the N25 for Waterford. At the Kilrush roundabout take the first exit, R672, sign-posted for Clonmel, Mallow, Lismore. At 3.2km from the Kilrush roundabout turn right staying on the R672 signposted for Clonmel. At 4.7 km turn right onto the L5103 signposted for Kilgobinet Sports Centre / Coolnasmear / Colligan Woods. At 6.8km turn right signposted for Kilgobinet Sports Centre. At 12.0km the Kilgobinet Sports Centre is on your right-hand side. Approaching Dungarvan from the Waterford side, take the by-pass staying on the N25 for Cork. At the Kilrush roundabout take the third exit, R672, sign-posted for Clonmel, Mallow, Lismore. At 3.2km from the Kilrush roundabout turn right staying on the R672 signposted for Clonmel. At 4.7 km turn right onto the L5103 signposted for Kilgobinet Sports Centre / Coolnasmear / Colligan Woods. At 6.8km turn right signposted for Kilgobinet Sports Centre. At 12.0km the Kilgobinet Sports Centre is on your right-hand side. From Clonmel take the R672 towards Dungarvan. After travelling for 28km from Clonmel turn left onto the L5107. At 1.5km, from the right turn onto the L5107, turn right at gates at the ‘T’ junction. At 1.9km take the left-hand fork signposted for Kilbrien. At 2.4km turn right at a ‘T’ junction. At 3.3km veer right at a ‘Y’ junction. At 4.0 from the turn onto the L5107 you will arrive at the Kilbobinet Sports Centre on the left-hand side. Turn Right over bridge. Sign posted Kilgobinet sports centre, Kilbrien, Coolnasmear. Fork Left at School, signposted Kilgobinet sports centre. Turn Left. Signposted Kilgobinet Sports centre & Comeragh Drive. Other Routes are available and are also signposted. Map Reference. S 237 / 005. GPS N 52° 9' 22·9. W 7° 39' 15·4. €25 Entry Fee. €20 Kilbrien entry fee.
. All starting and finishing at Killgobinet Sports Centre Bohadoon, Dungarvan, County Waterford. All four walks take participants to the top of Cruachán with its beautiful views of Dungarvan and the bay. The area of the walk is on O.S.I sheet 75. By participating, you are making a contribution to the West Waterford Hospice. Clonmel to Killgobinet Sports Centre Bohadoon. This self navigated walk is 45kms, has an ascent 2,000m (approx) and is aimed at the very experienced and fit walker with navigation skills. It takes walkers via Lachtnafrankee and Knockanaffrin ridge to the Nire Valley, then via the Gap, Carrignagour, BoolaCairn to Coumfea, Seefin, Farbreaga and Cruacháun. 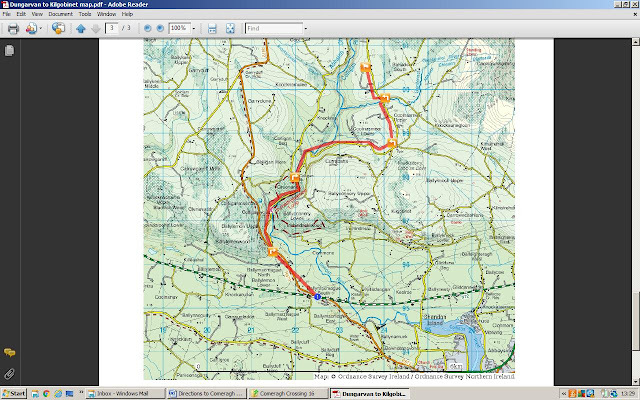 This walk is 35kms and takes 8 – 10 hours to complete via Long hill, Punch bowl and the slopes of Knockanaffrin to the Nire valley, then Coumfea, Seefin, Treenearla commons, Mauma road and Cruachan. Mainly on mountain terrain with 1,250 ascent (approx). Club marshals and sweepers will be on the route. The Nire Valley car park to Killgobinet Sports Centre Bohadoon. This walk is 22kms long and has an ascent of 900m (approx), it takes 5 – 6 hours to complete. Club marshals and sweepers will be on the route. This walk is 10 kms and has an ascent of 350m (approx) and it takes about 3 hours to complete. Club marshals and sweepers will be on the route. Cunnigar Crossing. The weather was great for the 190 people who took to the murky depths to cross to the Cunnigar. Thanks to Peter, Ann and John for making it a great success. Austrian Holiday We now have a coach booked for the return trip to Dublin Airport. Cost €35 per person return. Collecting money from now. Please consider taking on a committee position as some key members are standing down. Marshal For 792 Mountain Walk Marshals for all walks Check point officials. There was a large troop of scouts spending the weekend in Melleray when we arrived and the weather was perfect. The group consisted of 10 club members and 2 visitors. We made our way through the farm and up to the turn off for Melleray cross, then followed the forest road to the edge of the forest and continued out on to Dyrick. We took our break at the summit and admired the stunning views. Knockmealdown Mountains and as far as Crohaun was cloud free. The Galtees, River Blackwater all the way down to Dungarvan Harbour and Helvick Head looked like a picture postcard in the bright sunshine. There was general agreement that there was great enjoyment to be had on the walks and trails of the Comeraghs and Knockmealdowns, the fact that the day was bright and sunny was a bonus. We eventually left Dyrick and made our way back to the carpark in Melleray along the same route, the walk took 3 hours, and there was a stop at the Cat’s on the way back to Dungarvan.